This month the GammaScout Geiger Counter used for data logging local background, developed a fault. I managed to get it working again, but in the process lost some day average logging data, hence the gap in the chart. April month averages tend to vary from year to year by a significant amount. As the Southern Hemisphere winter approaches, air flows here swing a lot between Northern Tropic air to Southern Ocean air flows. If we get more tropical air in April the background goes up. If there are more Southern Ocean air flows, the month average goes down. Since Fukushima, this has become a dynamic of the local background monitoring. If you look at the charts on the yearly average background page, link below, you can clearly see an annual winter background dip showing up in the year and month background charts. Caloundra April month average, year comparisons. The stats are in, and March 2018 had the highest recorded March background ever recorded here, at 46% above average. What is creating these Southern Hemisphere increases? 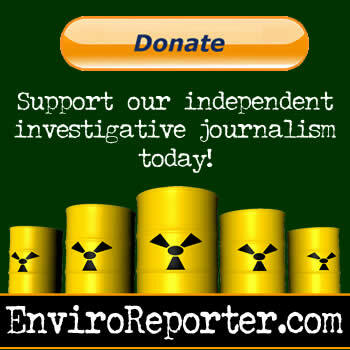 Fukushima atmospheric contamination? Increases cosmic rays? Radon releases, or combination of all off these? Alert Caloundra 27th March 2018 – In the morning the GammaScout Geiger counter started to alarm on and off very quickly. One visual observation showed a spike of 0.625 uSv/hr. Looking at all the very short duration high detections I have been seeing recently, it suggests to me that I am detecting lots of hot particles in the atmosphere. If I didn’t have 60 second sampling and a 0.30 uSv/hr alarm setting in place, I would probably have missed these detections. They would have been hidden in the averages, because they are of such a short duration. The 24hr 60 second logging chart shows numerous short duration peaks between 8.30 am and 11.30 am. At the time we had one low pressure system sitting off the East coast plus another in North Queensland, look at the wind map link below. The wind map shows the local air mass at the time was coming off the Pacific Ocean. The main source appeared to be a high pressure system situated East of New Zealand. The air from it was being drawn into these two lows. This air flow was passing over this location at the time. My present theory is that contaminated air was drawn down from the upper atmosphere to the surface, by this high pressure system. The wind direction at the time was South Easterly, off the Pacific Ocean! It was an overcast, but a fine day. 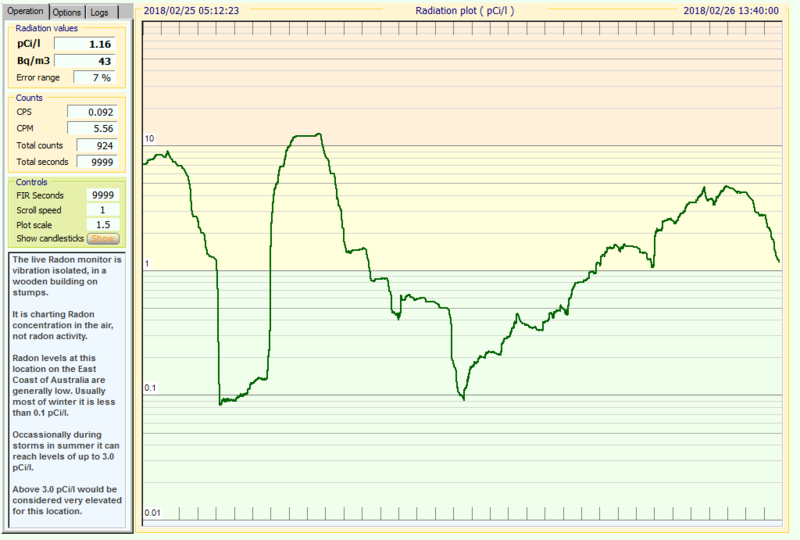 On the 27th March Radon levels where relatively low. Caloundra March month average, year comparisons. 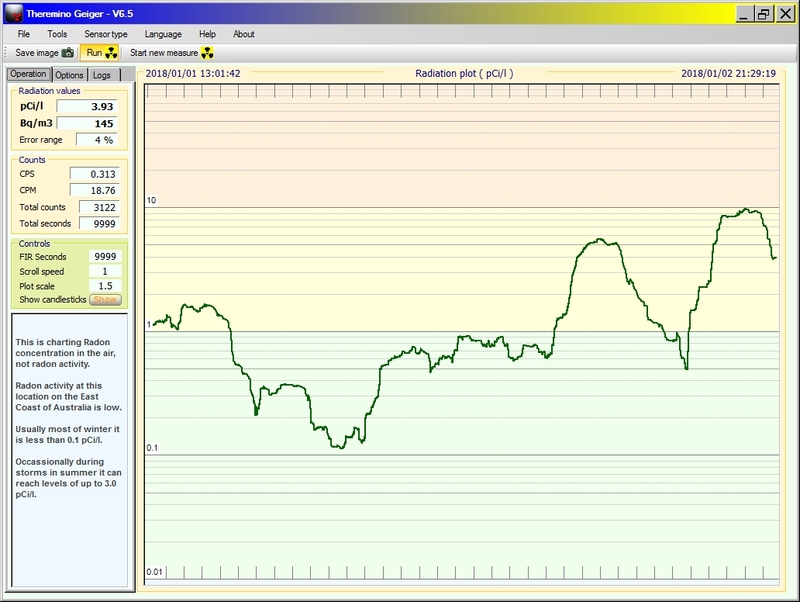 Year and month average local background radiation levels from 2007 to 2018. The month average for February 2018 was 49% above pre-Fukushima levels, the highest month average local February background on record. Late February also had three days that were 80%+ above average. 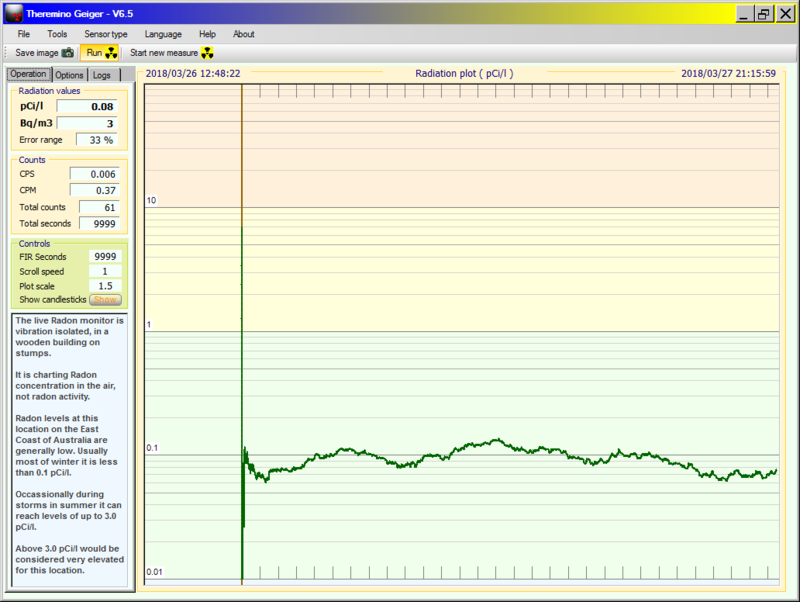 This is the first time here we have had three days in a row at 80% above pre-Fukushima levels. A contributing factor to the day average increases near the end of February would have been the 10 pCi/l + Radon spikes that were detected on the 23rd, 24th and 25th. The Radon spike detections were possibly a precursor to an up tick in earthquake and volcanic activity on the Pacific rim, as the surface wind was coming off the Pacific Ocean at the time. Even so, the elevated Radon levels would not account for all the month day average background increases. Caloundra February month average, year comparisons. 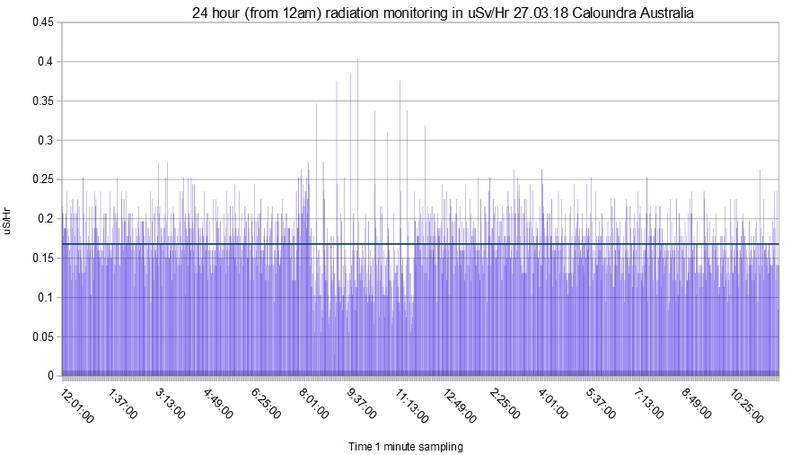 Caloundra 2nd January 2018 – Another massive Radon spike was detected and reached up to 10 pCi/L. At the peak of this spike it was very humid, but not raining, and the local Radon monitor was in a wooden building with the door and some windows open. Under these environmental monitoring conditions, this is a very large spike in local Radon levels. The wind direction during the event was from the tropics. 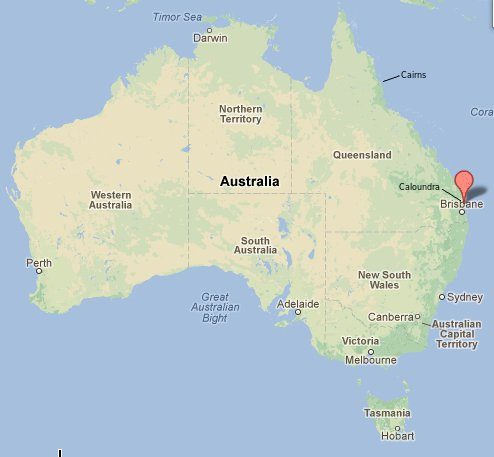 Caloundra January month average, year comparisons. On the 15th January there was a marked drop in background levels, as the wind direction changed to a Southerly from the Southern Ocean. This dynamic has been constant since Fukushima. Whenever Southern Ocean air flows reach here, we get a significant drop in background levels. What the bar chart colour codes mean. Cairns North Queensland January background Report – Fairly flat, the little spikes were coincidental with some thunderstorms and good rainfalls. The Cairns monitoring station has two GammaScout Geiger counters.